National Cyber Security Alliance. (2018). Data Privacy Day Impact Report 2018 [Ebook] (1st ed.). Retrieved from https://staysafeonline.org/wp-content/uploads/2018/03/2018-DPD-Report.pdf. Frenkel, S., Matthew R., & Confessore, N. (2018, April 10). Facebook Data Collected by Quiz App Included Private Messages. New York Times. Available at https://www.nytimes.com/2018/04/10/technology/facebook-cambridge-analytica-private-messages.html?action=click&contentCollection=Technology&module=RelatedCoverage&region=Marginalia&pgtype=article. Accessed April 11, 2018. Jenkins, A. (2018, March 28). These Companies Have Cut Their Ties with Facebook Amid the Cambridge Analytica Data Scandal. Time. Available at http://time.com/5216291/facebook-cambridge-analytica-companies-advertising/. Accessed April 10, 2018. Hetherington, J. (2018, March 20). Facebook Whistle-Blower Reveals Cambridge Analytica Is Tip of Data-Mining Iceberg. Newsweek. Available at http://www.newsweek.com/cambridge-analytica-just-one-hundreds-mining-data-facebook-852744. Accessed April 10, 2018. Mims, C. (2018, April 22). Who Has More of Your Personal Data Than Facebook? Try Google. Wall Street Journal. Available at https://www.wsj.com/articles/who-has-more-of-your-personal-data-than-facebook-try-google-1524398401?mod=trending_now_4. Accessed April 23, 2018. Beckett, L. (2014, June 13). Everything We Know About What Data Brokers Know About You. ProPublica. Available at https://www.propublica.org/article/everything-we-know-about-what-data-brokers-know-about-you. Accessed April 24, 2018. Paul, K. (2018, April 3). Everything You Wanted to Know About Data Breaches, Privacy Violations and Hacks. MarketWatch. Available at https://www.marketwatch.com/story/at-what-point-should-you-be-concerned-about-a-data-breach-2018-04-03. Accessed April 24, 2018. Manion, J. (2016, January 20). Data Security and Privacy: Marketing’s Top Conundrum in 2016. MarTech Today. Available at https://martechtoday.com/data-security-privacy-marketings-top-conundrum-2016-159239. Accessed April 17, 2018. Kaye, K. (2013, July 23). Study: Data Crucial to Marketing but Expensive to Safeguard. AdAge. Available at http://adage.com/article/datadriven-marketing/brands-consumer-data-safeguards-dma/243225/?utm_source=update&utm_medium=newsletter&utm_campaign=adage&ttl=1375196439. Accessed April 17, 2018. Digital Marketing Institute. (2017). Why Marketers Should Care About Privacy Rulings. 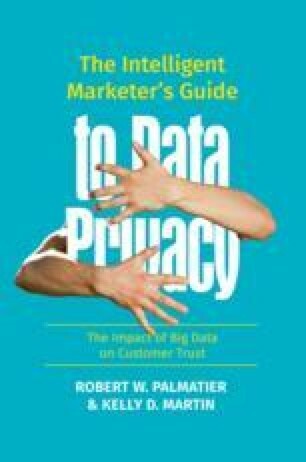 Available at https://digitalmarketinginstitute.com/blog/2017-8-03-why-marketers-should-care-about-privacy-rulings. Accessed April 17, 2018. Davidson, J. (2018). Forget Facebook, Meet the Company That Will Pay You for Your Personal Data. Retrieved from http://time.com/money/3001361/datacoup-facebook-personal-data-privacy/. Chinni, D., & Bronston, S. (2018, April 15). Why Data Privacy Could Unite Red and Blue American. NBC News. Available at https://www.nbcnews.com/politics/first-read/why-data-privacy-could-unite-red-blue-america-n866081. Accessed April 16, 2018. Rosenbush, S. (2018, April 16). The Morning Download: Companies Should Beware Public’s Rising Anxiety Over Data. Wall Street Journal. Available at https://blogs.wsj.com/cio/2018/04/16/the-morning-download-companies-should-beware-publics-rising-anxiety-over-data/. Accessed April 19, 2018. O’Brien, M., & Jalonick, M. C. (2018, April 11). Is Facebook Regulation ‘Inevitable’? Not so Fast. ABC News. Available at https://abcnews.go.com/Technology/wireStory/facebook-regulation-inevitable-fast-54403103. Accessed April 19, 2018. Olmstead, K., & Smith, A. (2017). What the Public Knows About Cybersecurity. Pew Research Center. www.pewinternet.org. Tarnoff, B. (2018, March 14). Big Data for the People: It’s Time to Take It Back from Our Tech Overlords. The Guardian. Available at https://www.theguardian.com/technology/2018/mar/14/tech-big-data-capitalism-give-wealth-back-to-people?CMP=share_btn_link. Accessed April 19, 2018. Yokubaitis, R. (2018, January 19). It’s Time to Take Our Privacy Back from Tech Companies. The Hill. Available at http://thehill.com/opinion/technology/369573-its-time-to-take-our-privacy-back-from-tech-companies. Accessed April 19, 2018. Marketing Science Institute. (2018, January 19). Marketing at a Privacy Crossroads, Featuring Jonathan D. Avila, Vice President and Chief Privacy Officer, Stores, Inc. Best of MSI Webinar Series. Available at http://www.msi.org/video/marketing-at-a-privacy-crossroads/. IBM Security, Ponemon Institute. (2017). 2017 Cost of Data Breach Study. Available at https://www.ibm.com/security/data-breach. Accessed March 1, 2018. Fuhrmans, V. (2017, October 12). New Worry for CEOs: A Career-Ending Cyberattack. Wall Street Journal. Available at https://www.wsj.com/articles/cybersecurity-tops-priority-list-for-ceos-after-string-of-high-profile-hacks-1507821018. Accessed April 19, 2018. Table Compiled from Various Sources Including Armerding, T. (2018, January 26). The 17 Biggest of the 21st Century. CSO. Available at https://www.csoonline.com/article/2130877/data-breach/the-biggest-data-breaches-of-the-21st-century.html. Accessed April 20, 2018; Acuant, “40 Biggest Data Breaches of All Time”. Available at https://www.acuantcorp.com/40-biggest-data-breaches-time/. Accessed April 20, 2018; and the Privacy Rights Clearinghouse at https://www.privacyrights.org/data-breaches.